I’ve written before about Join.Me for communicating with others while sharing your computer screen. (See the most recent post.) But let’s say that you don’t want to share your screen. You just want to have a conference call (maybe join via your computer or by phone), see who is speaking during the call, and maybe even share some files. And maybe you have some people who will be on the call who haven’t bothered with downloading Skype or figuring out Google Hangouts. Like Join.Me, Speek just needs users who can follow a link. 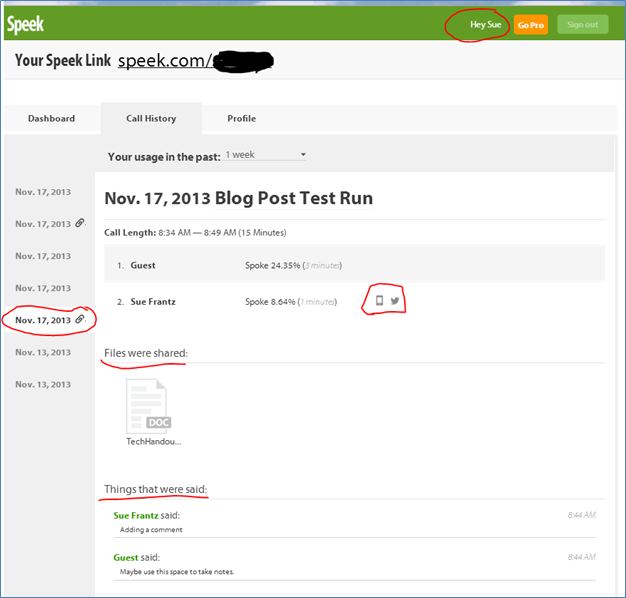 Speek.com is one of the newest kids on the audio communication block. 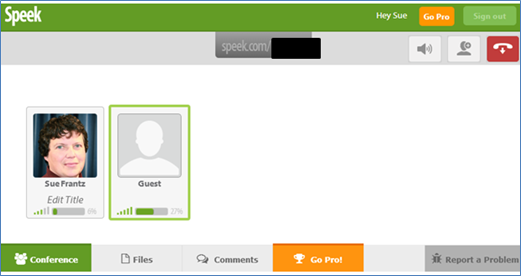 Give your Speek URL to your conference call participants (in the free version up to 5 people can join a call including you), and Speek will give them three options for connecting to your call. Only the person originating the call needs to have a Speek account. When you create your free account, the username you choose will be your Speek URL. Visiting that URL brings up the connect page. Before you connect, be sure to log in to Speek. This will give you administrative privileges on the call. More on those below. Your conference call participants will see the same screen when they visit the page. Connect to the call by using the mic/headphone on your computer, have Speek call your phone, or you can call in to the Speek number then enter a PIN. Your participants can choose any of the three methods as well. Once connected, you’ll see everyone on the call. Here it’s me and my guest where my guest was actually me calling in on another device. At the bottom of the screen are a set of tabs. The “Conference” tab shows who is on the call, who is currently talking (outlined in green), and the percent of time each person has spoken displayed under each avatar. I don’t know that this last feature actually keeps certain problematic people from dominating the call, but for those who don’t wish to dominate, it’s useful feedback. If you mouse over one of your conference call participants, you will see the options to mute them or remove them from the call altogether. How’s that for power? To mute yourself, click the speaker icon in the top right corner of the screen. This is an essential tool for when the postal carrier comes and your dogs go bananas – hypothetically speaking. Click the “Files” tab to share files with the others on the call. Drag and drop a file from a folder onto the gray box on the right side of the screen. Or you can click “file browser” to navigate to the file you want to upload. Participants who are connected to the call by something other than a phone can click on the filename to download it. The only people who can see the files are the people who are currently on the call. If someone arrives late, they won’t be able to see the already-uploaded files. I see the “link your accounts” option, but I’m not sure what benefit that serves when you can just drag and drop. Maybe it makes sense if I’m using a computer that is not mine. I could access my files directly through, say, Dropbox.com. Click on the “Comments” tab to, well, add comments. This is a useful space to take notes or put together a to-do list for each conference call participant. Have someone else you want to add to the call? Click the person icon in the top right corner, and enter the person’s phone number. Speek will give them a call. When they answer, they will hear, “Welcome to Speek,” and then they will be connected to your conference call. Since there isn’t much information for them to go on, you either need to speak very quickly once they’re connected or drop them an email or text message to let them know that Speek will be calling on your behalf. You’ll be given the option to name your call. It’s not a requirement, but it may make it easier for you later. Click on “Hey <your name>” in the top right corner to access your Speek dashboard. You will see a summary of your Speek usage for the last 30 days, which you can change to a different time period. Click on the “Call History” tab. On the left are the calls for the last week. The ones with paperclips have files that were uploaded during the call. If I click on a call, I see the name of the call (“Blog Post Test Run”), call begin/end (total time), who the participants were along with their participation time percentage (minutes) – if Speek has their contact information, it’s provided to the right of the name (phone number and Twitter handle, in this case), the files that were shared which can be downloaded again by clicking on them, and the comments that were made in the comment pane during the call. 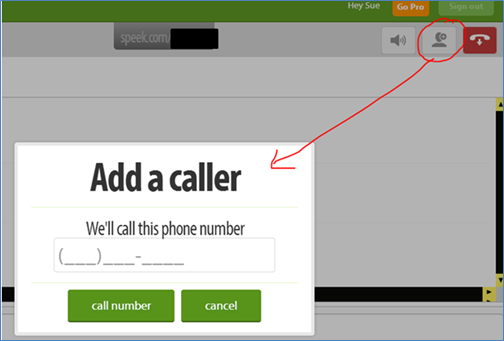 If someone joins your Speek conference call when you’re not on, their call will also appear in your call history. Aside from the obvious uses for collaborators or committees working at a distance, I could see where someone might want this when, say, advising students over the phone. Share files and make notes as you talk. 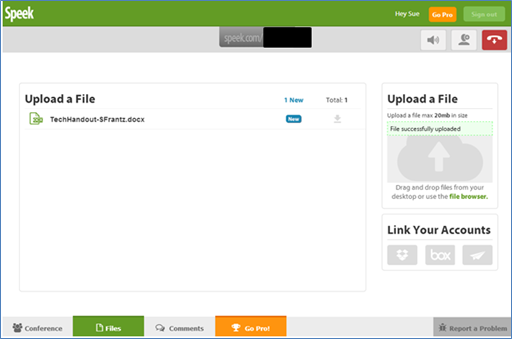 If you’re hyperconscious about documentation, Speek is certainly the tool for you. 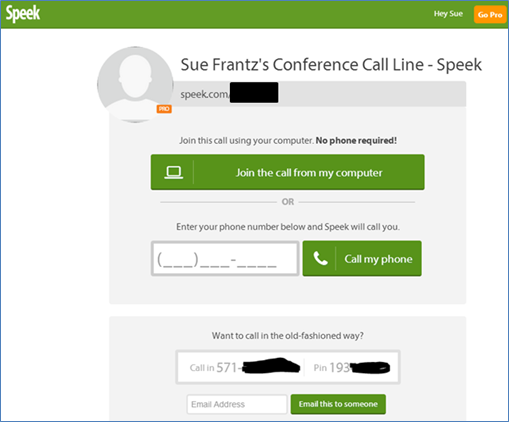 If you want to be notified by text message when someone joins your Speek conference call when you’re not already on the call, go into your dashboard ( click on “Hey <your name>” in the top right corner), and select the profile tab. Under “SMS notification” select the number you want to use for texts. There is an app for Android, iOS, and Windows phones. Interestingly the Android app is compatible with my Samsung Galaxy Nexus phone, but not my Samsung Nexus tablet. While I could connect to the call through my tablet’s web browser, the mic worked fine, but I couldn’t hear anything. I did just try one web browser though; I may have better luck with a different one. You’re probably better off with the app. For $10/month or $100/year, you can have an unlimited number of participants on your call. And you can have Speek audio record your conference call. 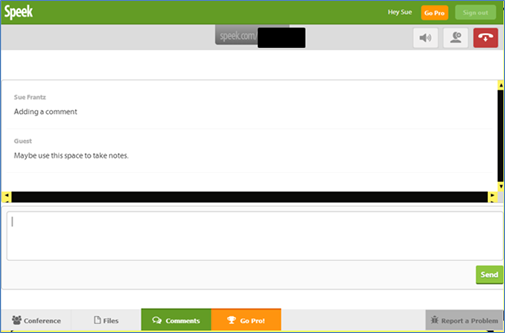 Speek’s page (updated August, 2013) that describes the difference between the basic and pro accounts says that the pro account grants file sharing and commenting. The basic account, as of this writing anyway, includes those features. If you would like to try a free month of Speek Pro, you just need to convince 3 people to join. On the dashboard page, on the far right you’ll see the offer. Click on one of the avatars to get to the sharing options page. Ready to give Speek a try?